My 2017 goal for you is to put yourself at the top of your "favourite things" list; make 2017 the year of YOU! 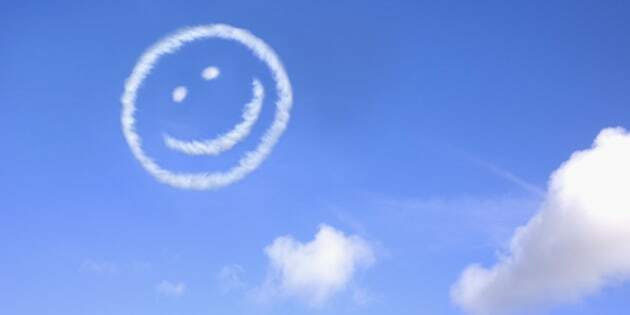 A happy face made from jet trails in a blue sky. In February 2016 I started my series of "favourite things" blogs -- a list of my current favourite exercises, nutrition tips, recipes, and health mantras. I am not suggesting you aim to get fit and be a "whole new you." If you need to become more mindful of your health choices, do it -- but don't wish to be a new you in the process. Instead, work at becoming a version of yourself who loves yourself enough to exercise and eat well. Your body is not a garbage can -- don't put garbage food into it. Your health is important, so prioritize daily movement. In honour of this goal, this list of favourite things is composed of mantras, mindsets, and strategies that will help you prioritize YOU so that you can become the healthier version of you that I know is possible! 1. Favourite internal hashtag: #IamWorthyOfSelf-care! Your health quest is something you are doing for YOU; at its core is the notion of self-care! Care enough about yourself to put healthy food into your body. Eating fresh berries is a present to yourself, not a punishment. Deciding to eat processed crap full of preservatives is not a "prize." If you always put others first, remember that you deserve the same care that they do. Try to give yourself the same attention and time you give to others. Take the skills currently reserved for your friends and family and devote them to your health! Don't make perfection your workout goal. Something is always better than nothing. When you can't get to the gym or do your full workout, do something for 10 minutes. Try my "10 by 1-minute" workout. The workout is broken down into 10 one-minute intervals. Within each minute, you must complete X 10-12 reps of two exercises back-to-back. Done early? Relax for the remainder of the minute. If it takes you the full minute to complete both exercises then you have to immediately start your next interval. Two possible options are burpees and jumping jacks or push-ups and squats. Have 20 minutes? Do two 10-minute sets. Journaling can help highlight the disconnect between the health choices we think we are making and the choices we actually make, as well as the reasons behind our choices. Record food choices, portions, alcohol and water consumption, as well emotions and intentions behind your food choices. You can stress-eat or binge-eat out of loneliness on any diet -- lots of people overeat gluten-free cake and Paleo treats. If you don't become aware of the what, why, and how of your eating patterns, your personal food habits will simply follow you from nutrition program to nutrition program. The "X vs. O" journal can be a helpful way to gain an understanding of your emotions in relation to food. Draw five circles on each page of a journal. Each page represents one day, and the five circles represent three meals and two snacks. After every meal ask yourself, "Did I stop eating when I was full and did I generally make healthy choices?" If the answer is yes, you don't have to write down what you ate; simply put an X through the circle. If you made food choices that you were not happy with, write down what you ate, as well as how and why you ate the food. Were you tired or depressed? Did you grab food mindlessly off your co-worker's desk or eat as you cooked? Hopefully your week will be full of Xs, but it it's not, figure out when and why you made your unhealthy choices. Decide how you can make better choices next time. The foam roller is the traditional self-massage tool. I LOVE the roller, but it can be hard to travel with. Plus, the balls are more precise. Try the small ball upper back release. Start on the floor with your bum on the ground and the ball under the inside of the bottom tip of your shoulder blade -- between your back and the floor. Relax over the ball. Breathe. Slowly move your body forward so the ball moves up along the inside of your shoulder blade. Pause on trigger points. You don't need complicated programs and expensive diets. Stop externalizing the health process -- ultimately you are the only one who can make healthier choices. Buying the most recent health book will not help you -- no matter how valid the info in the book is -- if you don't actually implement changes. Own your health choices, use common sense, and don't assume that just because you have heard the advice a million times that you are actually following it. -Stop "mindlessly" eating. Don't eat in front of the TV, while you are working, or while you walk. -Listen to your body! Don't eat for the sake of eating. You don't have to finish everything on your plate. If you have had enough, stop. Period. No exceptions. -Don't eat the product if you can't pronounce the ingredients. Avoid processed foods! -Don't keep crap in the house. Sure, at the grocery store you can tell yourself that you will be disciplined, but you won't always have the same resolve. Don't tempt yourself. If you want a treat go out and have a small portion at a restaurant or at a friend's house.